Step, kick, stab; step, kick, stab; step, kick, stab—so it goes for the majority of long mountaineering expeditions, for days on end, relentlessly uphill. Above 17,000’ (or even above 14,000′) simple tasks like these— raising your boot to the next foothold, jamming your crampons into the snow, and plunging in your ice axe for security in exposed terrain—can become monumentally challenging. The clink of gear, the swish of your parka, the wind through the peaks, cold snow beneath crampons and the sound of steady breathing serve as the soundtrack to some of our most physically challenging days in the mountains. Climbing Denali, or any comparably massive mountain, can be a rigorous and unglamorous affair. It also can be one of the most rewarding feats of your life. It’s nearing the point in the year where we begin to think about when we will reach our “peak” fitness for the year, and how we can time that to coincide with our next big trip. While the steps everyone takes up any great mountain are relatively similar, level of fitness can dictate how quickly, how comfortably, and how successfully you make the summit your dreams—be it Everest, Denali or the technical 13,000’ peak you’ve been eyeing in your backyard. Especially for high altitude mountaineering, optimal level of fitness holds countless advantages, improving circulation and breathing, and preventing exhaustion and “bonking” during the huge vertical days. Fitness makes back-to-back tough days possible; it helps you crawl out of your sleeping bag into the -20 weather to go uphill all over again, day after day, until you reach the top (and come back downhill again safely, with energy to spare). But, the training for such a long uphill mission can be a bit mystifying, especially for climbers who have never spent more than a week endeavoring towards a single peak. To do everything that we can to set our climbers up for success and elucidate expedition-specific training, we’ve teamed up with Uphill Athlete, founded by accomplished mountaineer Steve House (who has put up impressive first-ascents around the world) and coach Scott Johnston, to offer all of our 2018 Denali climbers a training program that will help them work “harder and smarter” to put in the work necessary now to reach the summit later. The Base and Specific phases will help get your muscles ready to keep moving onward and upward through 10 inches of fresh snow on the fixed lines above 14,200′ on the West Buttress. While they seem arduous in the moment, high on the route is exactly when all of those box jumps, weighted step-ups and sprint intervals will invariably come into play. Finally, you’ll reach the taper phase (either incredibly difficult, or very welcome, depending on your training personality), where you’ll allow your body to rest to assimilate all of the hard work you’ve put in over the course of a few months. You will of course find more information on these phases by reading up on more information from Uphill Athlete. The mountaineering training program builds both aerobic base for optimal endurance, the cornerstone of successful alpine ventures, and improving strength-to-weight ratio, essential for shouldering what may very well be the heaviest pack of your life, and carrying all of the supplies you need to survive up the flank of a giant, glaciated Alaskan peak. Uphill Athlete believes strongly in a high volume of steady-state, low-intensity cardio in hilly, variable terrain. Although it will feel as if you are moving incredibly slowly, and may not even feel as if you are getting a “work out” at first, you will notice large gains in your overall fitness and endurance. 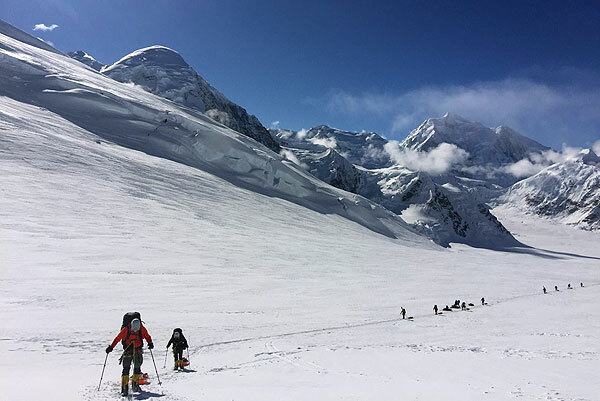 After all, the majority of the miles ascending Denali or Aconcagua are completed a near-conversational pace. The low-intensity makes the work much easier on the body, allowing you to put in more miles that you may have previously thought possible. The program will fit into the jig-saw puzzle of each climber’s life, with work schedules, family, friends, commitments, etc., slightly differently, and your training will undoubtedly look different day to day if you live in Arkansas or Alaska or Arizona. Perhaps the largest benefit of the plan is the recording element, that is built in to help keep climbers accountable while dealing with busy lives and those days when you really just don’t want to hit to the gym for your “Max Strength” day. 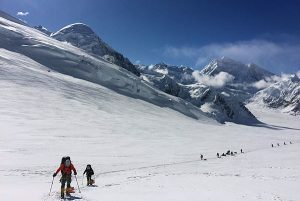 I will be following an Uphill Athlete program in the months leading up to Denali season to prepare for a few ski objectives of my own in Alaska. A Steve House phrase that often helps me through my training for a particular objective is to think of hours spent lifting weights and lugging packs filled with water jugs uphill as “putting money in the bank” that will pay off later when I push through the crux of routes I hope to follow. Further, I highly recommend Training for the New Alpinism, also by Scott Johnston and Steve House of Uphill Athlete. The book, which preceded the various plans offered on the website, is not only a great read, but will provide you with nutrition advice to supplement your training, anecdotes from the sport’s foremost athletes to inspire you to get out into the hills (and teach you lessons that they have learned the hard way in the field), and narratives of the years of climbing, training and alpine progression that helped inspire the formulation of Uphill Athlete’s plans. Training can transform our big mountain goals from incomprehensible dreams to attainable realities. For those of you following the program, feel free to email or call either the Mountain Trip office or Uphill Athlete with questions. 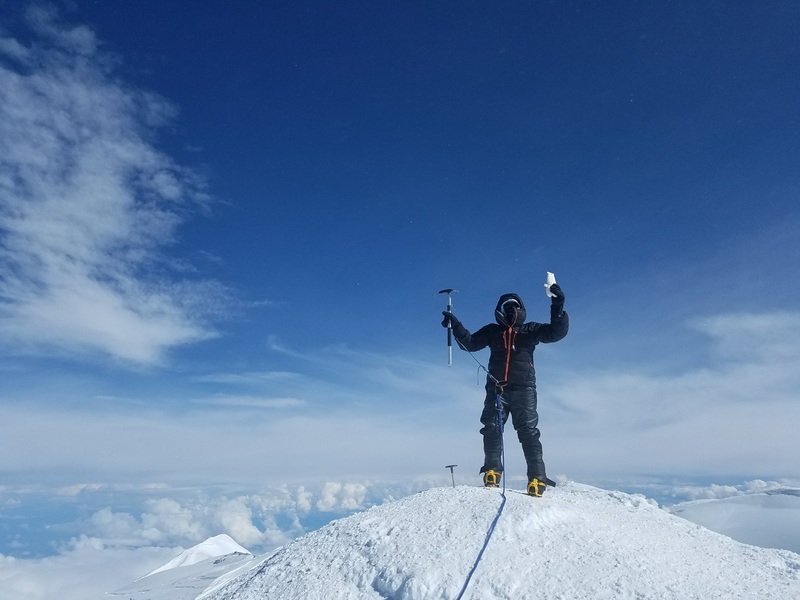 If you’re planning on climbing Denali with Mountain Trip in 2018, you’ve already received your code to get started on your Uphill Athlete plan. It’s never too early to start building up your fitness to push through those hard days.